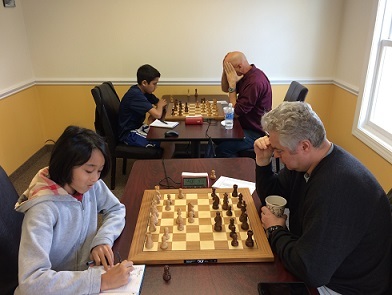 This Saturday's G/45 Quads hosted 14 players to make up a total of 3 sections, one of which was a Swiss. On the first section, Michael Amori took home gold, earning a perfect score of 3/3 total points. In the second section Rohan Krishna earned first place with a near perfect score of 2.5/3 total points. Lastly, in the third section, Dylan Kang took home first, also earning a near perfect score of 2.5/3 total points. Congratulations to all of our winners and thank you to all of our participants! We look forward to seeing you again soon!